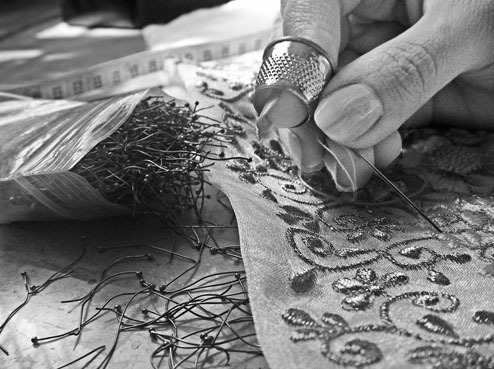 Each Arga & Arga gown takes months to prepare and complete.The process starts from the selection of the raw fabric. Patterns are individually drawn by our pattern design team and carefully hand-stitched to the fabric. The master embroiderer will then take over the piece, individually attaching crystals, gold work or thread work to the pattern. The piece will then be cut, sewn and combined with layers of fabric for added-definition and balance and to reflect our clients’ individual styles. Once sewn by our master tailor, the piece is examined inch-by-inch to ensure the handwork is impeccable. The result of course is that no two pieces are ever alike, making each Arga & Arga gown a piece of art. On silks, chamois, velvets and satins, we do gold-tone wire-work, silver-tone wire-work, Silk Thread shading, Appliqués, crystal and rhinestones, glass, wood, velvets, ribbons, seed beads, sequins and our signature precious and semi-precious jewels. For our goldwork with metallic threads and wires, our artisans first cut the metal threads by hand into small pieces and then appliqué them to the surface of the embroidery fabric using very fine hidden threads or Purl threads and bullion threads which come as long hollow flexible tubes spliced by hand and sewn down piece by piece. We mix many forms of embroidery onto single pieces. For example our ribbon embroidery provides a textured raised effect for Flowers and botanical motifs bringing classic Victorian technique to the present –day. While in our Cut-work, also referred to as Roman or Venetian embroidery, small areas of the backing fabric are cut by hand and then ornamented with satin or silk thread. Some of our heavier pieces reflect a typical 17th Century Jacobean style of floral motifs and raised embroidery techniques which we place on a modern silhouette. Drawing inspiration from Oriental embroideries, where such work originated and has been produced for centuries, we also make use of Chinese, Mughal Indian, Japanese, Persian and Turkish fine needle-work techniques from throughout history to influence our designs. Our silk embroidery using fine, beautifully shaded silk threads, produce a smooth, shiny texture and rich graduated colours on our gowns. 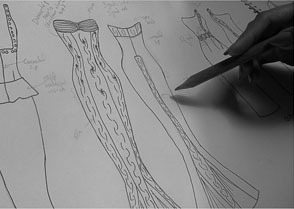 The labour intensive process of creation, costly materials used and the intricate design and pattern cutting before the cloth can be stretched onto the frame is the main reason why such work continues to be celebrated even today; and why it is such a perfect choice for an heirloom gown that can one day be passed on to your children.  Since its opening, Arga & Arga has initiated strong relationships with craftsmen. This social responsibility ensures that all our designs are produced by expert craftsmen and women, aiding many people in addition to our designers. Typically these niche hand-crafting skills are passed down through generations of artisan families, and Arga & Arga aims to continue supporting this as it grows. We also have a Personalization service where your chosen Initials and date can be inscribed into a discrete place on your gown depending on the fabric of the item. Please contact us for more details. Personalization Embroidery Service.